Home Depot and Char-Broil parted ways a few years back and while this obviously hurt Char-Broil more than it hurt Home Depot, it left a hole on the showroom floor. The biggest part of that hole is in the area of an inexpensive infrared gas grill. Char-Broil has been the only manufacturer to offer this style of grilling, and while its true merits are debatable, there certainly is a demand for this technology. Enter Nexgrill, always willing to provide grills to large box stores, with a unique "infrared" gas grill. In fact, this grill has the unique feature of being convertible between conventional cooking and infrared. The big question is, however, whether or not this is a real infrared grill and how well it actually works. As I said above, the breakup between Char-Broil and Home Depot left the biggest hardware retailer without a low-cost infrared grill like the ones they have carried for years. For 2016, Nexgrill, long a partner or Home Depot, has introduced the Evolution Gas Grill. This 5-burner grill has nearly 500 square inches of cooking space and a standard side burner, making it not all that different from many of the other shiny stainless steel gas grills that will be sitting next to it. What makes this grill different is its unique take on infrared grilling. For those who don't completely understand the concept, infrared heat is radiant cooking. This is opposed to conduction cooking (food in contact with something hot, like in a skillet) and convection cooking (like baking bread in the oven where hot air cooks the food). The appliance in your kitchen that is most like an infrared cooking device is your toaster. Some consider infrared heat a better cooking source since it can be much hotter than other sources and since it isn't heating the air around foods, doesn't cause food to dry out as quickly. Of course, when we talk about these lower price infrared solutions we are not talking about ridiculously high temperatures. Grills like this one cook very much like a standard grill and the method used in this model is highly suspect when it comes to infrared technology due to its design. Let me explain this point in more detail. The Nexgrill Evolution gives you the option of placing what they call infrared heat plates over the standard cooking grates on the grill. These infrared heat plates are actually sheets of stainless steel with perforations that supposedly convert the conventional heat of the burners into infrared heat. The problem with this design is that you actually cook on these plates, which are heated by the burners more than they convert heat to infrared. This isn't really infrared cooking, it is conduction cooking, which while effective, doesn't have the same grilling experience one would expect from a typical grill. Aside from this issue, which is, of course, a major one, the Nexgrill Evolution is typical of this size and price of gas grill. This unit is very large and has a number of features, yet it only weighs around 100 pounds. That includes all the cooking grates, infrared heat plates, side burner, and fully enclosed cabinet. 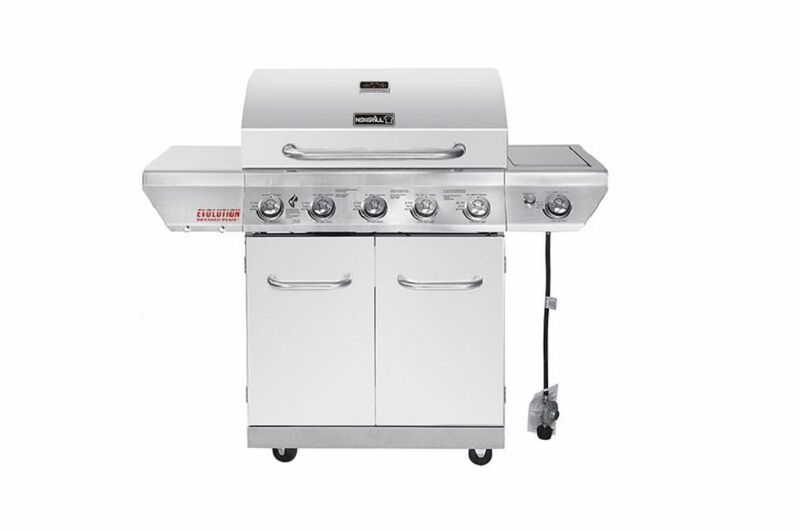 As is typical of gas grills of this size and style, the overall construction quality is rather limited. There are also issues with flare-ups and warping of the infrared heat plates. If this style of gas grill interests you, I suggest that you drive over to a Lowe's Store and take a serious look at the Char-Broil Commercial Infrared 4-Burner Model# 463242715. It is a better made grill and ​you don't have to keep moving the infrared converters around.